Our little Bengal cat Grace was just 9-years-old when we had to say good-bye to her. She was too young when she left, but every day was a good day for Grace. For that, we are very thankful. Grace was known for her love of Tiger, another Bengal cat in her bungalow. If you saw Tiger, Grace wasn’t far behind. She was smitten. Her brother Max would also compete for her attention, but if she had a choice, her attention would be focused on handsome Tiger. She and her brother Max arrived as very shy cats from a rescue group and always bonded with other cats over their caretakers. But they were active cats, running around their habitat, climbing their logs and playing with their bungalow mates. 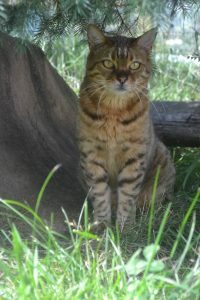 Grace was one of the most beautiful Bengals with a shimmery coat and golden eyes. Her demeanor mirrored her outside beauty. She had been treated for chronic respiratory issues for over a year. She was picky about her meds, but her caretakers always found the right treat to make sure she ate them all. She was monitored weekly by our vet and was actually doing pretty well compared to some bad spells she had previously. So we were stunned we would be saying good-bye so soon. Grace went peacefully in her sleep, but we needed answers. Diagnostic tests were completed and her lung issues did not appearato be the reason for her passing, though they were compromised. A mass found on her liver, which has been sent out for further testing, is suspected as the cause for her passing. Having answers won’t bring her back, but it will bring us some peace. Every time we say good-bye to a resident, they take a piece of our heart with them. Grace was no different. She was small in stature but still filled our hearts. Grace – Tiger, Max and the others will miss you. They will find comfort in each other. We will miss you, too! May you watch over your friends from your new, forever life. TWS was contacted by a Bengal rescue group in Colorado. A larger breeder was closing down and they needed to place the cats that were not adoptable. 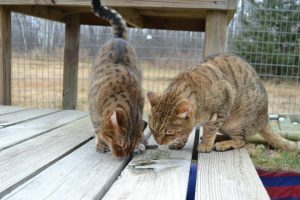 They had several hybrid F3 Bengals that were unable to be socialized for adoption. Grace was born in 2004 and came to the sanctuary in 2006 with her brother Max. They now live in a bungalow together with several other Bengal cats including Grace’s love: Tiger. Grace is very shy around people, but can be seen following Tiger around the enclosure and even lying out together on perches on a sunny day. It is definitely true to say opposites attract when talking about these two because Tiger is one of the most outgoing cats we have. They all live in a large bungalow that has both an indoor and outdoor area, which has perches, hammocks, logs, boulders, and an in-ground pool. The bungalow also has enough room to run around and just be normal cats.